There has been a heap ‘o tilting around here lately. 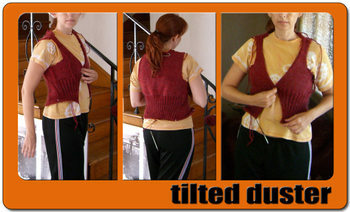 This Tilted Duster is not hard and perhaps my next project should be a tad more challenging (like something along the lines of what my sister is starting), but for now we’ll think of this project as comfort food. Easy, satisfying and filling the knitting need. As you can see from the photos, this really does go quickly. The size 8 needles and worsted weight Lamb’s Pride make for progress in the fast lane. You knit the skirt piece in one piece with the ever growing stockinette sections to break up the 2×2 monotony.